Food companies can take a shortcut to innovation at Cargill’s fully remodeled, one-of-a-kind research center in Plymouth, Minn.
MINNEAPOLIS - Aug. 19, 2014 – Faced with tight margins and tough competition, many food and beverage manufacturers and food service companies have very limited R&D resources to come up with the products consumers want. Cargill’s newly expanded Food Innovation Center in Plymouth, Minn., promises to be a unique environment where the company’s own researchers work side-by-side with customers’ staff to gain an edge. Completely remodeled and doubled in size, Cargill’s Plymouth Food Innovation Center offers retail and food service customers full access to state-of-the-art research equipment and the collective knowhow of its food scientists. The result: An innovation environment that reduces product development cycles and improves access to global market insights and technologies. “This is a one-of-a-kind facility—and we believe it will give our customers a competitive advantage,” Dow said. 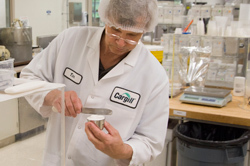 Cargill will also bring the majority of its North American food and ingredient research staff together in the $5.5 million expansion, which doubled the square footage of the facility from 20,000 to 40,000. The facility will help Cargill customers thrive by providing extensive ingredient expertise in numerous food categories, including snacks, cereal, bakery, confectionary, convenience, and frying applications. Cargill senior food technologist and master baker Tim Christensen works in the company’s recently expanded Food Innovation Center in Plymouth, Minn.
Cargill’s Food Innovation Center is the company’s primary R&D facility serving food and beverage manufacturers and food service customers in North America. It is an integral part of Cargill’s network of Global Cargill Innovation Centers, including the European and Latin American Food Innovation Centers. In the past few years, Cargill opened innovation centers in Campinas, Brazil; Wichita, Kansas, U.S.; and New Delhi, India; and has expanded its European Research and Development Center in Vilvoorde, Belgium. Cargill provides food, agriculture, financial and industrial products and services to the world. Together with farmers, customers, governments and communities, we help people thrive by applying our insights and nearly 150 years of experience. We have 143,000 employees in 67 countries who are committed to feeding the world in a responsible way, reducing environmental impact and improving the communities where we live and work. For more information, visit Cargill.com and our News Center.